The best part was it was eaten by Akanksha who thought the whole bread sounded sweet and smelt sweet. 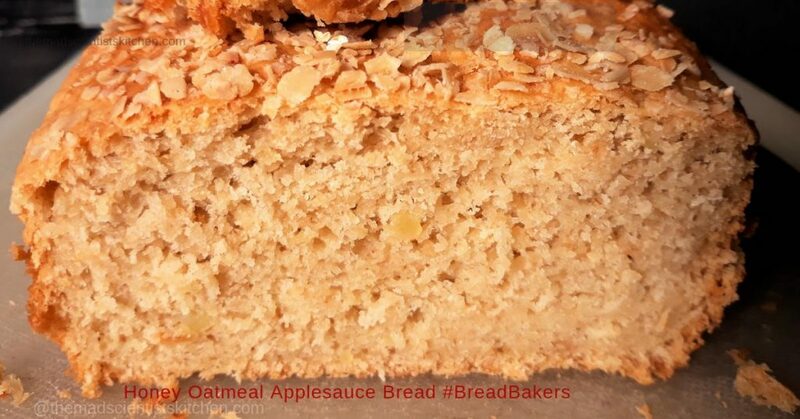 For #BreadBakers we take turns in hosting and the host makes a choice of the kind of bread we will bake. Sounds pretty interesting, huh? Join us. This month Renu is our host and we are connected on different blogging groups I know she prefers healthy bakes and her choice was healthy bakes with fresh fruit and no sugar. Tricky one what are you going to feed the yeast? I was not sure I will participate in any of the challenges. Have so many challenges at home but here I am participating in Bake-a-Ton a challenge that Srivalli has every year and we post 3 times a week. The condition is just baking… anything baked is acceptable. With just 1 recipe written, I have committed to the full month so now I am scrambling. How I manage to do this to myself I don’t know. I chide myself every time and yet end up setting up herculean tasks. Okay, enough of my rambling and” feeling sorry for myself trip “let’s get down to the bread of today the one I have copied from King Authur Flour. First I don’t know why but I got confused and soaked the instant yeast to rise. Second, my pan was too broad my loaf pan is missing so I did not get the promised height. Also, I used sweet potato in place of potato flakes we do not get potato flakes here and I did not have potatoes. In case you are using active yeast with the brown sugar set it in warm water to proof. In the lukewarm water add the oats mix well. Let rest for 20 minutes so that the oats absorb the water and soften up. After 20 minutes add the ingredients except for the milk and oats for sprinkling to mixing and mix using your hand, mixer, bread machine. The dough must feel springy once you finish kneading it. By bread dough standards it will be quite stiff. Lightly grease the bowl and place the dough in it. Cover and let it to rise, for 2 hours or till it doubles; it’s a slow riser. Grease lightly an 8 1/2″ x 4 1/2″ loaf pan. Set aside. Deflate the dough gently and shape it into an 8″ log. Cover the pan loosely with lightly greased plastic wrap. Let the dough rise for 1 45 minutes to 2 hours or until 1 1/2″ over the rim of the pan. Towards the end of the rising time in my case, it was about 1 hour 15 minutes, preheat the oven to 180°C/350°F. Brush the top of the loaf with milk, and sprinkle with oats. Tent it loosely with aluminium foil, and bake for 25 to 30 minutes. The bread is done when it is golden brown. Cool the bread outside the oven for 5 minutes before inverting it on a cooling rack. After 20 minutes add the ingredients except for the milk and oats for sprinkling to a mixing and mix using your hand, mixer, bread machine. The dough must feel springy once you finish kneading it. By bread dough standards it will be quite stiff. Lightly grease the bowl and place the dough in it. Cover and let it to rise, for 2 hours or till it doubles; it's a slow riser. Grease lightly an 8 1/2" x 4 1/2" loaf pan. Set aside. Deflate the dough gently and shape it into an 8" log. Let the dough rise for 1 45 minutes to 2 hours or until 1 1/2" over the rim of the pan. We take turns hosting each month and choosing the theme/ingredient. Our theme this month is Breads with Fresh Fruit and no White Sugar. If you are a food blogger and would like to join us, just send Stacy an email with your blog URL to foodlustpeoplelove at gmail.com. 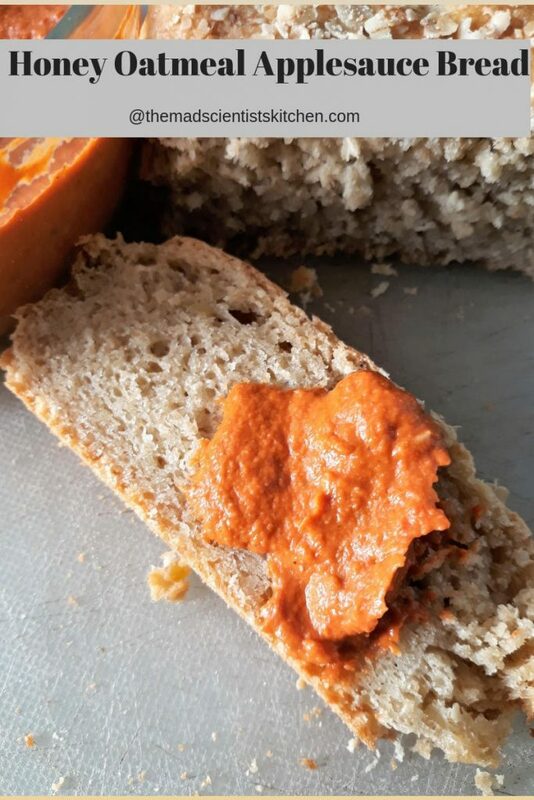 That is such a yummy looking bread Archana. Love all the ingredients that went into that loaf. Yummy!! Your bread looks awesome. Honey, brown sugar and applesauce…..it looks yum. Addition of sweet potatoes was a great idea. I am sure it must have been delicious. With all of the challenges, you still got a delicious looking loaf! 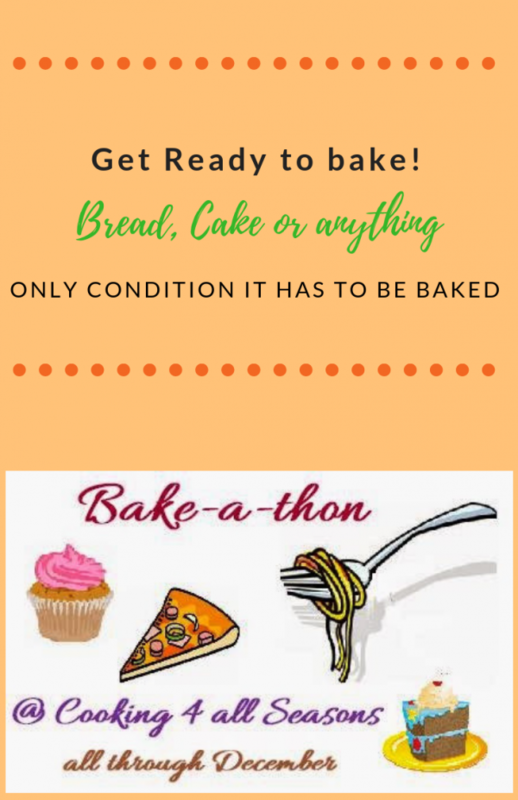 I can hear you arch, i m sailing in the same boat, how come i signed up for so many events this month with bake-a-thon!!! 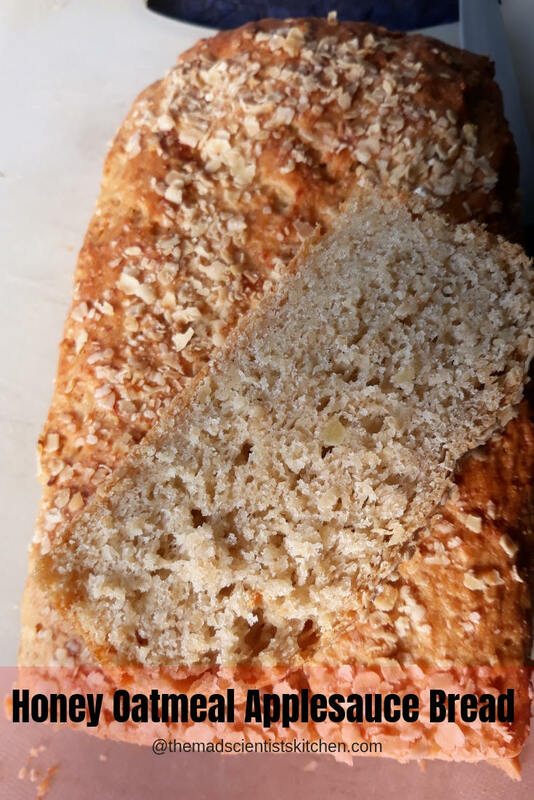 The honey oatmeal loaf looks perfect!! 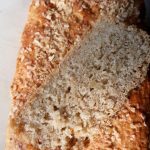 First a home made loaf , and then with oats and honey – wow ! Who wouldn’t like to indulge into such a treat ? The texture looks awesome and you are meeting quite a few challenges ! Tell me Vaishali how to complicate life :D. Thanks. Such a beauitful bread, that too with my favourite ingredients. Anything with oats and honey goes directly to my favourite ones. Bread looks awesome. Thank you, Priya. I really appreciate your comment for you are a fantastic baker. Love this awesome bread.. How creative you are in your bakes!! This is such a delicious looking bread and love those ingredients. The loaf has turned out beautiful in spite of all those challenges Archana. That is a really healthy loaf for sure.. Thanks, Mir. Will remember the tip. That bread surely looks amazing Arch, wonderfully baked. Archan I understand with all the challenges how difficult is it to bake and write a post for the blog.. love your spirit!! The looks so well baked and with a lovely crumb! lovely share!! That is such a lovely bread with healthy ingredients and beautiful crumb. Oats, honey and apple sauce all in one. The loaf looks so yum and healthy. Thanks, Renu thanks to you I moved out of my comfort zone. The ingredient list on this bread is very nutritious. I think the sweet potato added moisture to the dough so it is dense on the bottom. Reducing some liquid would compensate.